Ease and flexibility of input, with embedded help prompts. Economic value added valuation with flexibility on identifying economic costs with specific amortization periods. Accounting impact including profit and loss statement, balance sheet and cash flow analysis. Accurate handling of asset purchase, disposal and depreciation with capital and gearing impacts; Evaluation of new investments or changes to existing investments. Unique 'finite' terminal value calculation alternative to mimic investment life cycles. Unique Comparative Investment Score can be set to evaluate and prioritise different investments, depending on the prevailing business environment. Compatible with all versions of Excel for Windows as well as Excel for Mac as a cross platform business valuation and investment analysis solution. More resources for the Investment and Business Valuation template including video, user manual and support can be found on the Excel Business Valuation Template page. We have used this Excel spreadsheet for the company we work for and have to say that it is an excellent tool for business investment evaluation which has helped us to take best decisions. This is a great product and I found it very helpful on my last valuation project. A good practical template for business use and to learn. Also, an excellent company analysis product. 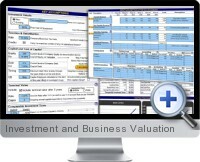 The business valuation template is easy to use and on point for accuracy. An excellent and straight forward template for valuing business. It is easy to use and thorough in its presentation of relevant detail.